If you enter W1 in the waitematawoodys search panel you will see Ken Ricketts has been a long admirer of this unique vessel. Now via a chance posting on ww Ken has reconnected again after 28 years. Ken was invited to inspect W1 by her present owner, who has W1 in the driveway of his home, given she is 70ft overall that in itself is impressive. Ken reports that her current owner has had her for approx. 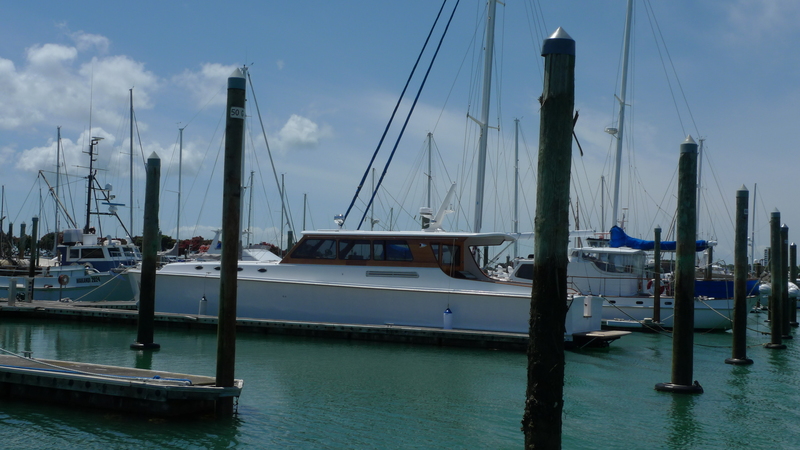 8 years having bought her off her Waiheke owner in a very run down state with her 2 x 671 GM Detroit’s belching lots of black smoke & with a view to carrying out a total interior & combings rebuild,which is now almost completed. It appears that with her very flowing new layout, complete with traditional varnished teak combings, she will very much look the part on the harbour & with her heritage will certainly be one of the most unique of all our classic boats. Refer the previous ww post for full details on her specs & history. The current refurbishment specifications include – 230 volt power, a full hot & cold commercial type air-conditioning system ducted right through the boat, water maker, clothes dryer, all the other latest & best of everything you would expect on a vessel of her size. Currently the restoration crew includes up to 3 artisan boatbuilders, along with the owner himself, part time, who are crafting her superstructure & fit out as if she is the royal yacht. The 2 x 671 GMs have become 1 x GM Detroit 8V92TI with a power output of 650 hp. This the owner anticipates will give a very good turn of speed — with a 32 inch propeller, through a 2 to 1 gearbox. She was only capable of about 13 knots flat out when she came out of the water. She now sports bow & stern thrusters & a new underwater exhaust system with fairly comparatively small, above water side outlets for idling, to avoid backpressure. The owner has personally just finished making 2 identical state of the art beautifully varnished teak game fishing chairs which will be mounted side by side for gamefishing when needed. He has never embarked on a job of this type before, but Ken reports that there is not a game fishing chair manufacturer in the world, that could have do a more perfect job. We look forward to seeing her in the water & ww will hopefully be there to record this magnificent (class of one) 70 year old vessel begin the next phase of her life. Lastly, Ken has a favorite hobby-horse & thats the changing of a vessels name by subsequent owners – Ken is of the belief the name at launch time should remain for the life of the vessel. Well Ken was very happy to learn that W1 will grace her stern again. A UK sister ship? – Dave Giddens was recently in the UK & spotted the boat below in St Ives, Cornwall. The photos below show the latest update in the life of W1 – her current owner, Francis Uren, has just completed an extensive ‘rebuild’ of the 70′ W1 (previously known as CORROMA, from the early 1950s) launch. The extent of the rebuild even includes air-conditioning………………..
Ken has been instrumental in securing her original WWII RNZAF identification No. i.e. #W1. Next step is sea trials & we look forward to a report on the performance of her single 8V-92TI 650 HP GM Detroit diesel. W1 has just been hauled out at Gulf Harbour hard stand for her first bum clean & for the fitting of here correct prop — a 32 x 33 LH Bri Ski. – The first one that was made, it was discovered just before she went in the water for the first time, when her refit wad completed, went the wrong way, so she has had temporary smaller one since launching, until the correct one could be fitted this week. Post re-launching, with the new prop, at 22 knots her wake was less than 12 inches & absolutely flat out the stern, as can be seen in the photo below. Impressive for a vessel designed & launched in the late 1930s. When I was about 15 yrs old a friend of mine and I sneaked on board W1 while she was on her private slipway on the Tamaki River, (tucked around the corner behind the owners house complete with large winch and railway dollies) She had not been modified at that stage (1968/9) and was still in original airforce colours with names still on the lockers in the forward crew room. The wheelhouse was varnished and the hull was white. The wheelhouse door (rear stbd of ) was varnished and louvred as was the radio shack door immediately to its left. To the right of the instrument panel and large chrome wheel was a companionway leading down to the mess room ? (the stair treads had cast aluminium oval ”British Power Boat” grips attached ) Forward through the bulkhead was a 4 berth bunk room, ahead of this a head and then a large chain locker. Up on deck and into the radio shack you went down through a hatch via a ladder attached to the forward engine room bulkhead. At the time she was fitted with 2 Greys marine diesels which were under grey painted canvas covers port and stbd with not much else in there. We assumed they had been put in by the Airforce as an economy measure as they looked to be only around 150 – 200hp size and did not look recent. aft of the engine room was another 4 berth bunk room and another head behind that with from memory a washing area. I think there was a hatch from there to the after deck. H1 was according to a Marine section news letter, powered by 3x 500hp Napier Lion marine engines for a speed of 38 knots. She was 64ft and built by the British Powerboat Company Of Hythe UK . Hope this was of some interest and that I have remembered things reasonably accurately, (it’s been a long time but having been lucky enough to have seen her in original condition at a young age has stuck with me all my life) I am also at present building a 36″ scale model of W1 for radio control. If anyone is looking for info on these HSLs etc I may be able to help if you are having trouble finding anything”. This entry was posted in 1940's, Launches, Military and tagged Caroma, W1 by Alan Houghton - waitematawoodys.com founder. Bookmark the permalink. I have just been given masses of data & some more pics of her by the Airforce Museum, which I would love to pass onto you. Dad – Keith Bellingham had it from about 98 to early 2000, we gathered a lot of info on properly restoring her, which unfortunately did not happen. The pics I took the other day she was doing 19 knots but she is till not up to full speed because she has to have a new bigger -prop — the present temporary one is 2 inches under size. Looks good in photos, gone is some of the top hamper. interested to know if any work was done on the sides eg refastened, glassed, splined etc, also will be interesting to see how it goes with the single, best we could get with old gms was 17kts lightship. W1 back in the water Sunday, 14th December, 2014. New photo added ex Dave Giddens – a possible UK sister ship? Was in contact with the owner on Wednesday & she is almost finished — herewith an excerpt from his last email to me — I quote; “Hi Ken, no firm launch date yet. Just finishing caulking the cockpit deck – labour intensive as doing it by myself! Still a few odd jobs then antifouling and we’re done. So that’s where she’s at — KENRICKETTS. 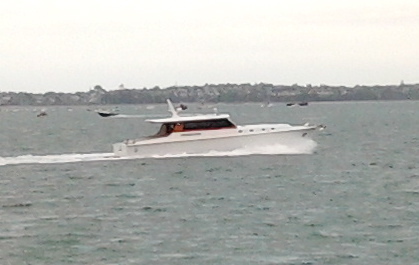 As I turned left out of my hovel in St Mary’s Bay and strolled up to Jervois Rd this morning I saw this magnificent vessel. Wow. I wonder how I possibly missed it on the nth strolls previous??? She looks good to go. Why not afloat?? ?